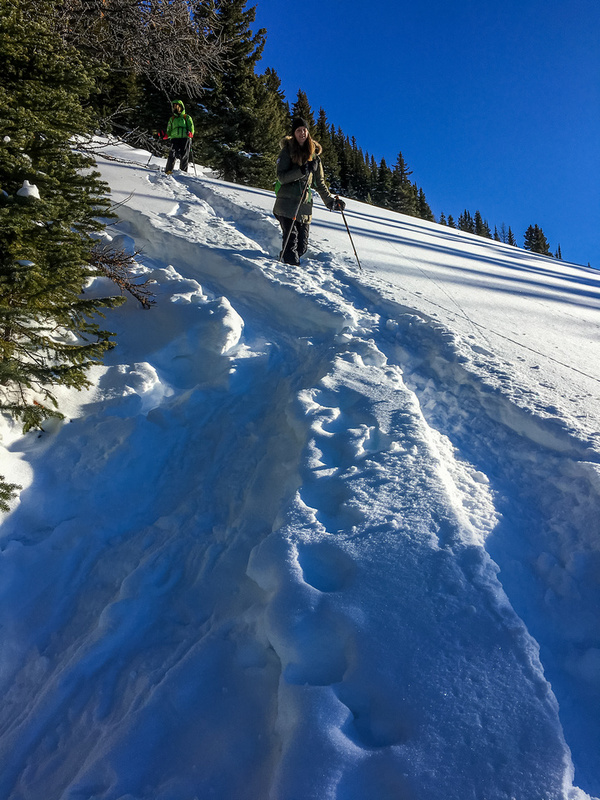 Difficulty Notes: Not many difficulties but in winter the upper route has some exposure / cornice issues in some conditions (i.e. if not blown dry). I wasn’t expected Little Galatea to be very difficult, but Matt indicated that they had turned back at a steep snowy section with some exposure so I made sure to pack the ice ax, just in case. 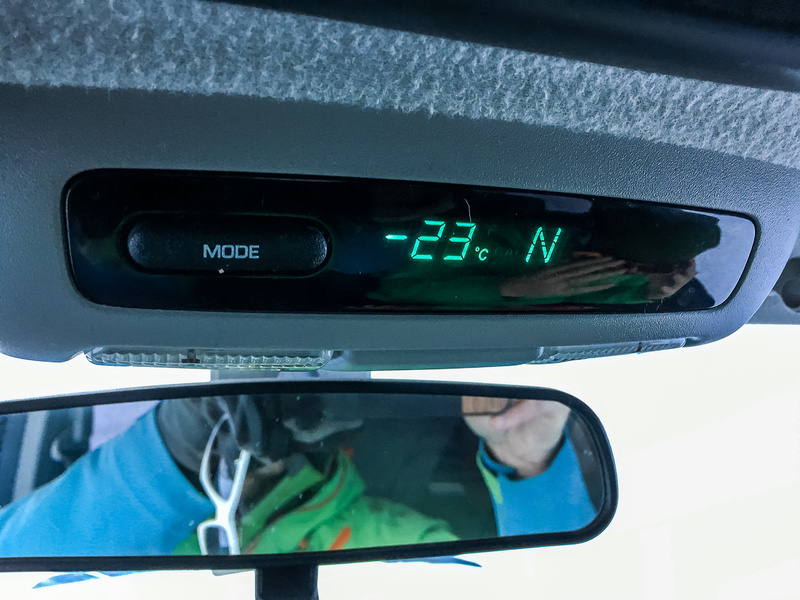 As we drove out to the trail head, the temperature started dropping precipitously until it was sitting ‘comfortably’ at around -23 to -25 degrees along the Spray Lakes Road! We weren’t too happy with those numbers, but we were prepared and started out from the truck near Engadine Lodge – the first ones there at around 09:00. Thankfully the work of snowshoeing quickly started to warm us up and by the time we were ducking back into the forest at the top of the logged section, we were even taking layers off. 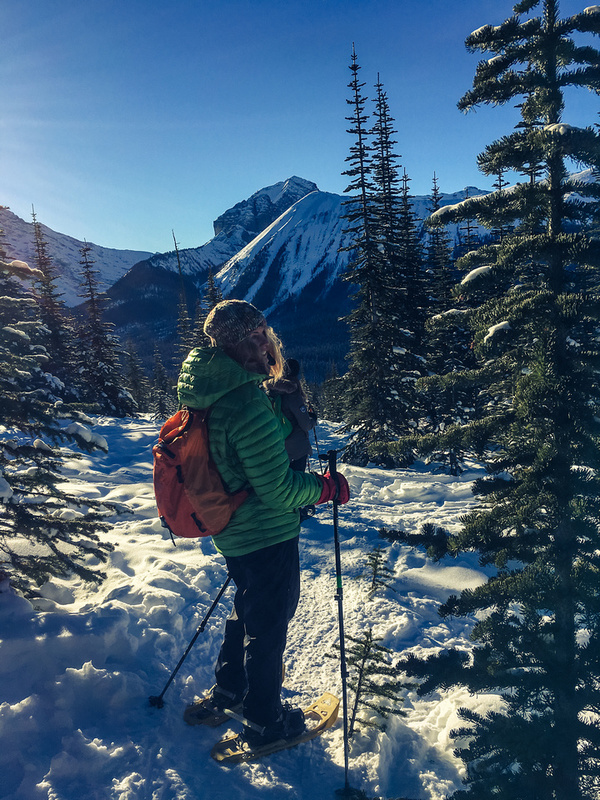 The section along the treed ridge was boring, as usual, but travel was very quick thanks to the concrete-hard packed trail to Rummel Lake – an extremely popular snowshoe / ski destination all winter long. I had the GPS route from Marko’s ClubTread trip report loaded into my phone and we spotted Matt and Matt’s tracks where they deviated off the main trail and proceeded to continue along the ridge rather than drop down to Rummel Lake with the rest of the masses. From the top of the clear cut the views are already pretty good, this is looking towards Birdwood (L) with the Fist, Smuts and Commonwealth Ridge at center. I have to say that the difference between following a track and breaking your own track, especially in sugar-snow, makes a world of difference. 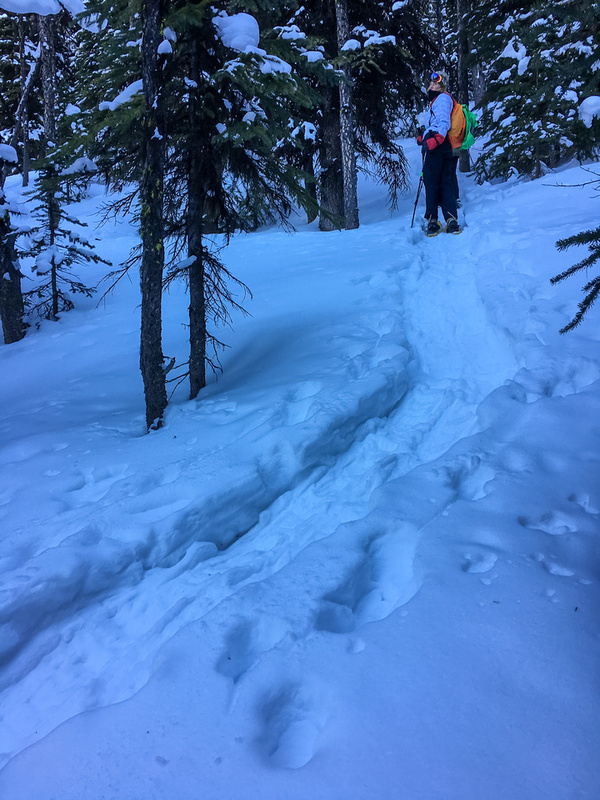 Thanks to the Matt and Matt trail breaking effort, we managed to make short work of the steep grunt to tree line after splitting off the Rummel Lake turn off. The route gets pretty darn steep already in the trees, and by the time we were on thin snow pack with no more trees, Hann was ready for a break. When we finally got to the ridge, she looked along it and declared she wasn’t going further. The weather was surprisingly warm at this point – we were all shedding layers. 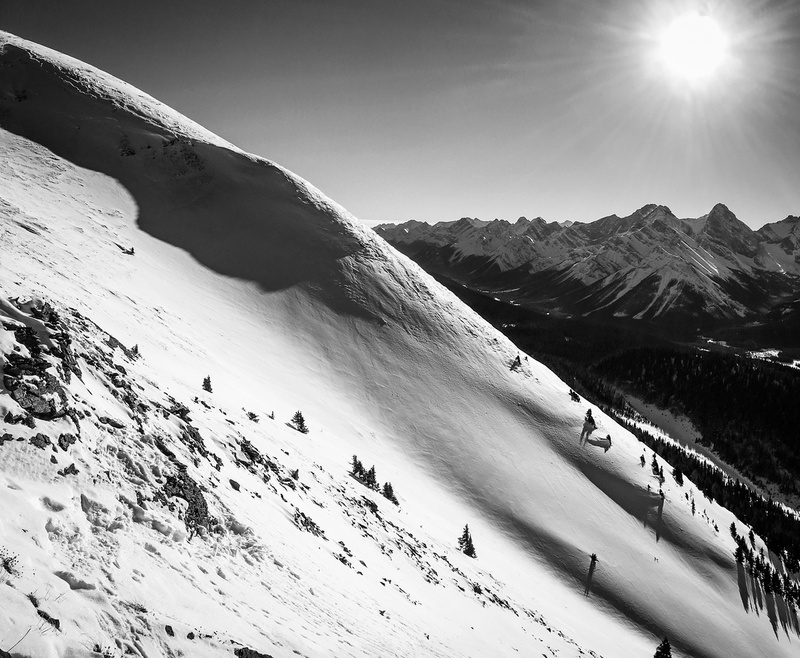 There wasn’t a breath of wind on the ridge, and the brilliant sunshine was rather warm. 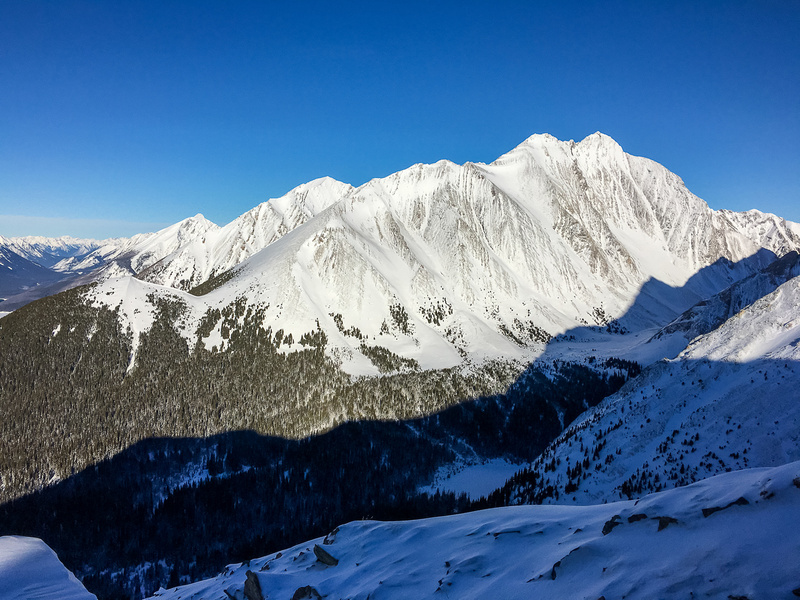 KC and I continued towards the summit which was still about 1km and a few hundred vertical meters along the ridge – which looked narrow and corniced in subsequent sections. It’s a steep grunt after breaking tree line! Commonwealth and Birdwood in the background. 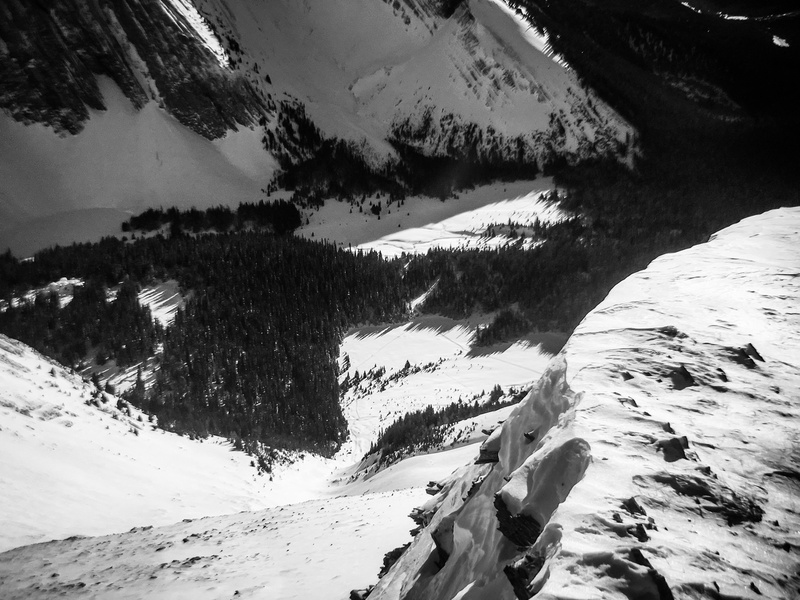 We had to be very careful around the cornices to our left as there is a huge drop down to the Rummel Lake bowl on that side. KC made it to the first bump but from there I cautioned her to turn back since the ‘shoeing got a bit more involved. On hindsight she probably could have joined me the rest of the way to the summit, but better to be careful than sorry. As she picked her way carefully back to Hanneke, I raced the rest of the way to the top, still another 500+ meters and 200 vertical away. I noticed right away where Matt had gone and turned back from. 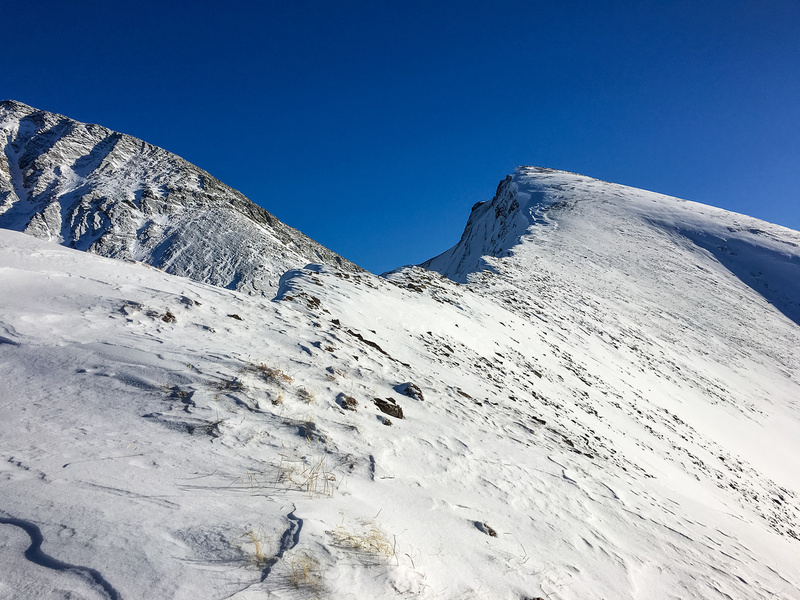 Rather than stick on the ridge (which looks very steep from the first high point), he traversed the steep roll to the second high point before turning back rather than complete the traverse. Instead of doing that, I just stick directly on the ridge, which wasn’t nearly as steep or exposed as it looked from afar. I managed to ‘shoe straight up to the second high point and from there slogged to the summit. I was sweating buckets by the time I reached the summit and I spent a few moments enjoying the incredible views in all directions. 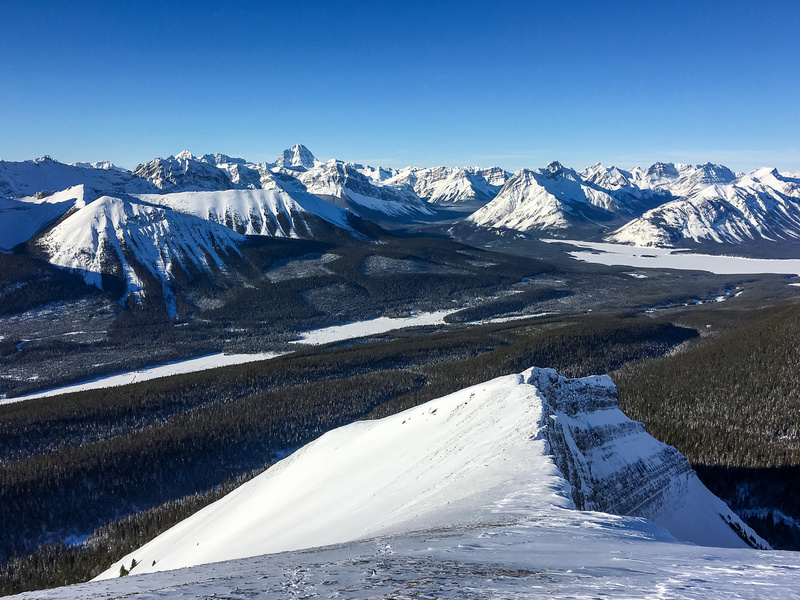 Pano looking south and west from the summit includes Commonwealth, Birdwood, Smuts, The Fist, Tent Ridge, Assiniboine, Shark, Turner, Fortune, Cone, Nestor from L to R.
Time to head back down. 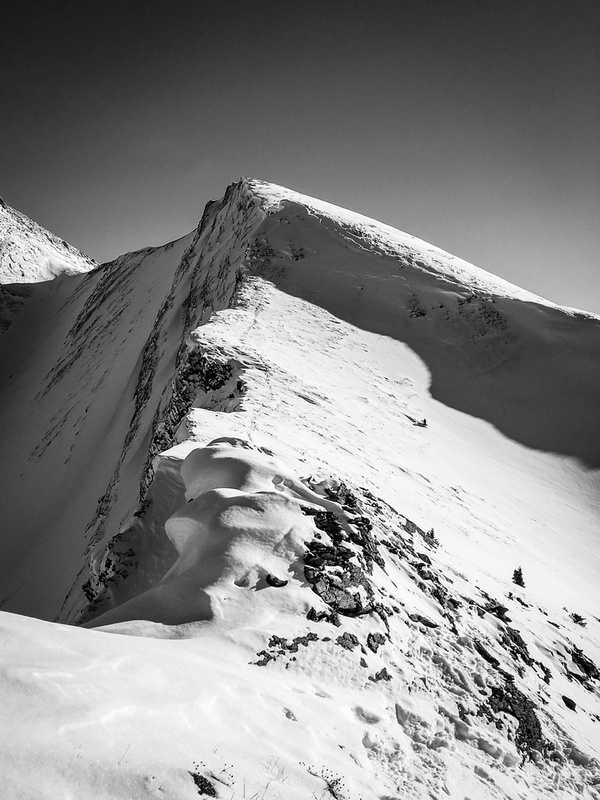 Again – note the steep cliffs on climber’s left of the ridge and the cornices. Be very careful when working your way along this section. Descent was quick. Before long I was drinking my Starbucks coffee at the first high point on the ridge while Hann and KC started down cautiously. I enjoyed the windless, warm perch with its incredible views very much. Totally unexpected given the cold temps that we left about 3.5 hours earlier! I could see people on Rummel Lake and hear them talking. I’m sure they heard and probably spotted us too. We followed our ascent line quickly back to the main trail and passed at least 20-25 folks heading into the lake on our exit. Goofing around while snowshoeing back to the truck. 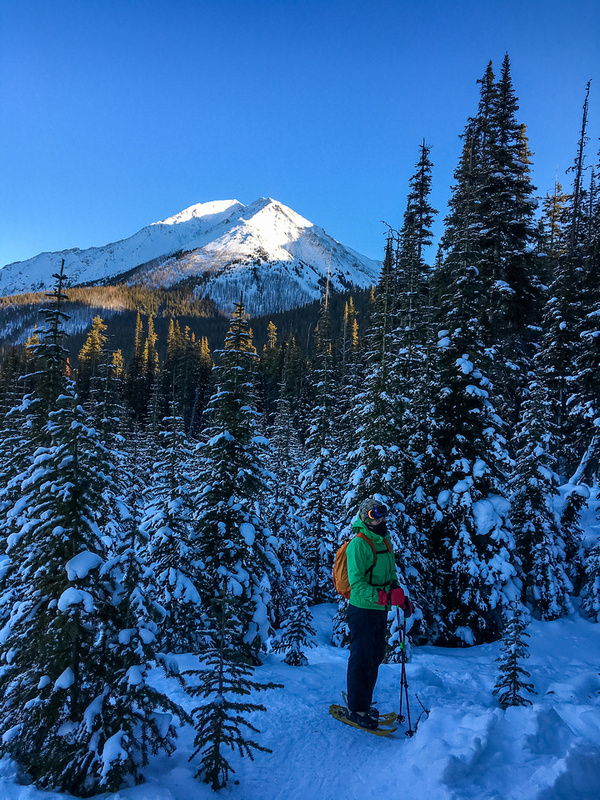 This is a highly recommended snowshoe outing. 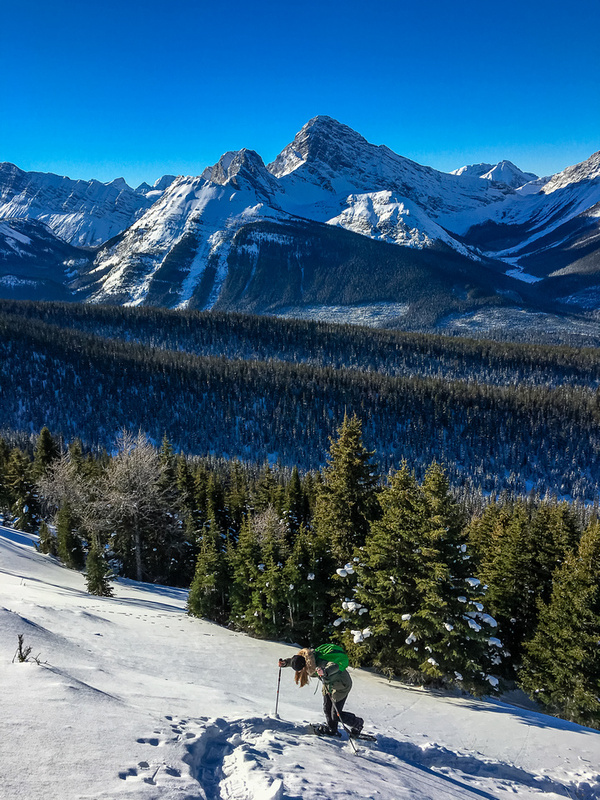 If you’re squeamish about heights / exposure / cornices you may not like the final ridge to the summit, but you’ll still get incredible views on a clear day from the first high point. Hanneke is dressed for the weather! It was a very cold morning. Rummel Ridge in the bg. Making our way up Matt and Matt's tracks from about a week ago - very, very helpful. Great views towards French, Sir Douglas, Commonwealth Ridge, Birdwood, Smuts and The First (L to R) from near tree line on ascent. It's a steep grunt after breaking tree line! Commonwealth and Birdwood in the bg. 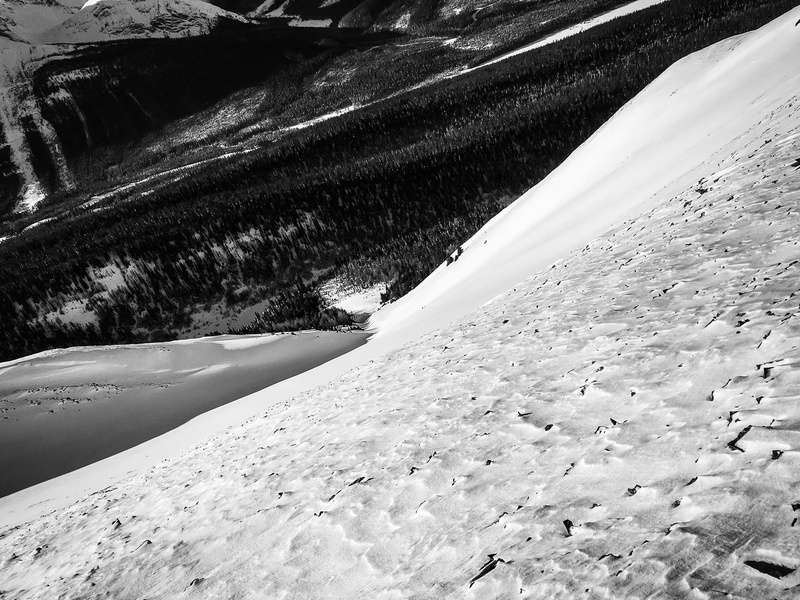 The snow pack started to thin out once we got above tree line - it was wind blasted. 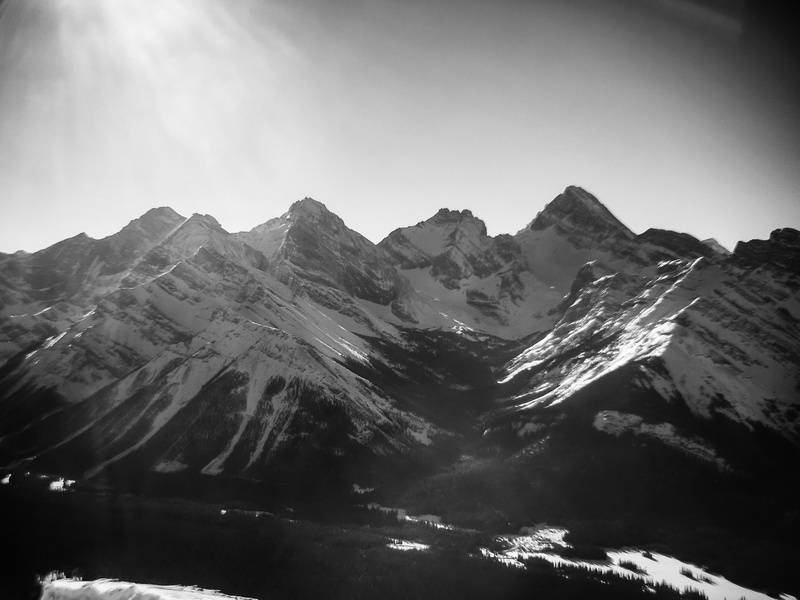 Tent Ridge, Assiniboine, Shark, Turner and Cone visible. 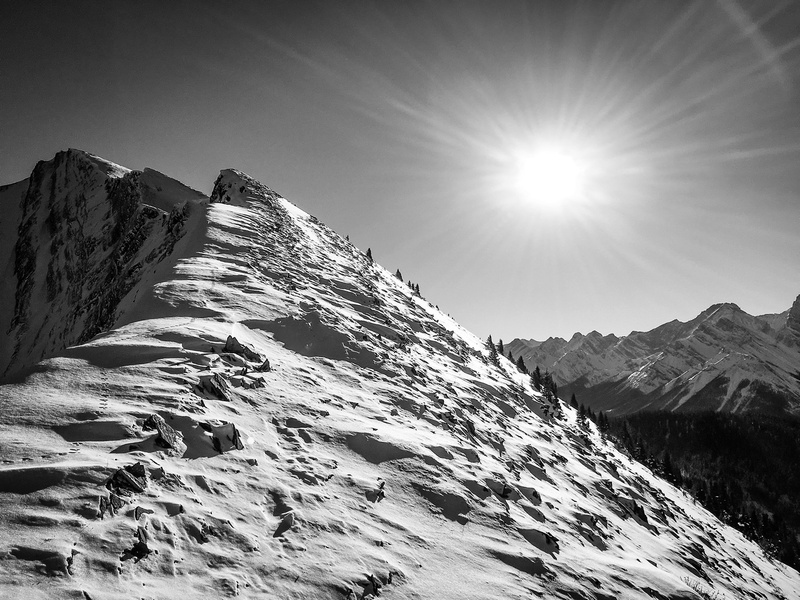 The rest of the route looks a bit intimidating with snow, cornice and some exposure. KC follows me up the ridge, Hann just visible on the high point behind us and gorgeous panorama of summits in all directions. Scree covered snow made for slick conditions with the 'shoes on. 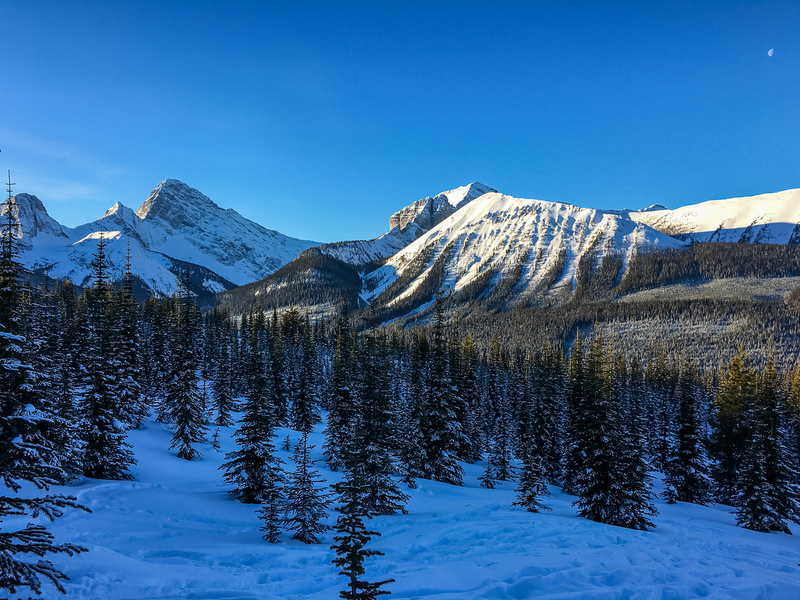 Looking across the Spray Lakes road towards Commonwealth Ridge, Birdwood, Smuts, The Fist and Tent Ridge. The Tower looms over Rummel Lake with Engadine in the bg to the left and Rummel Ridge at center left. The summit of LG is still a ways off at this point - best just to stick to the ridge. 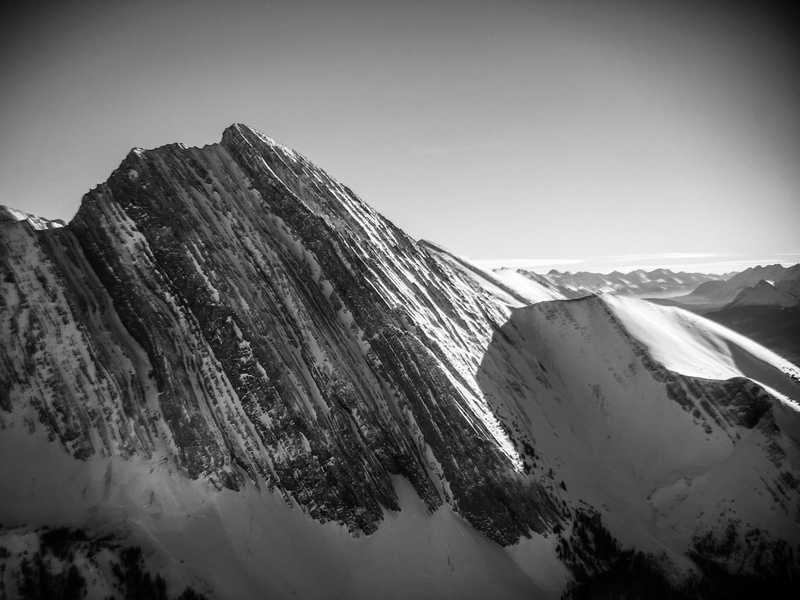 The exposure on the ridge is more obvious when looking back along it! Lots of peaks visible too. Galatea looms over Little Galatea - it's still one of my favorite Kane Scrambles. Gusty Peak and Chester to the right. 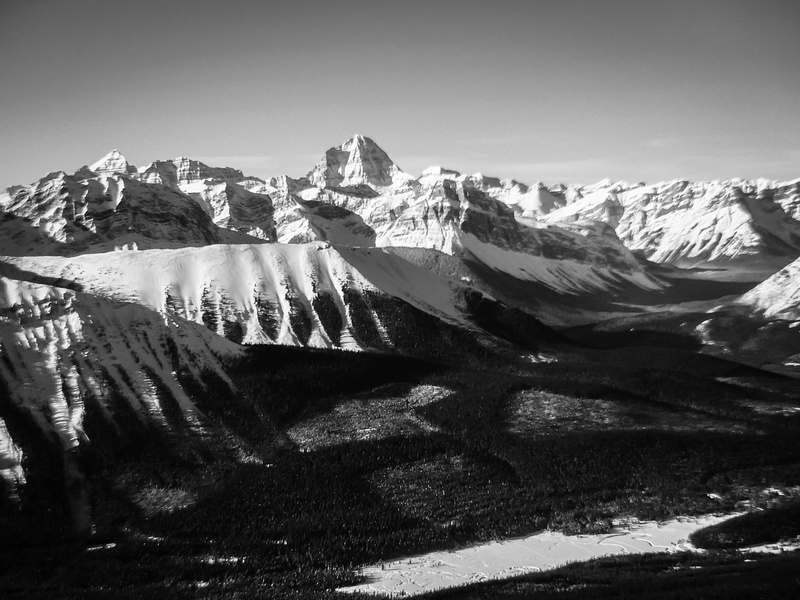 Commonwealth, Birdwood, Smuts, The Fist, Tent Ridge, Assiniboine, Shark, Turner, Fortune, Cone, Nestor from L to R.
Chester Lake is far below to the left with Mount Chester above. In the distance lies Warspite, French, Sir Douglas, Burstall. The Tower actually looks like a 'tower' from this angle. The giants of the Haig Icefield include Sir Douglas, Robertson, French and Smith Dorrien (R to L). Seems like a long time ago that I scrambled Chester. Mount Birdwood is definitely on my list. 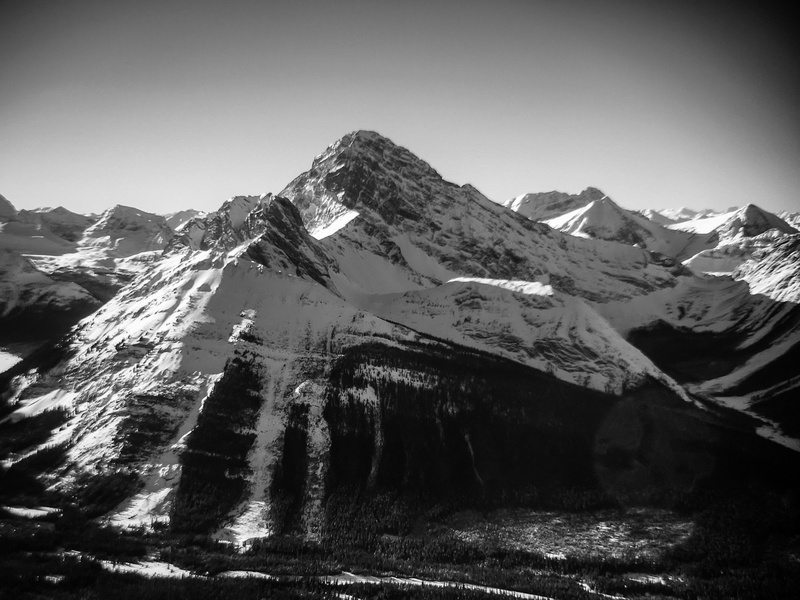 Still one of my favorite climbs - Mount Assiniboine is visible from just about everywhere in Kananaskis Country as long as you're above tree line! 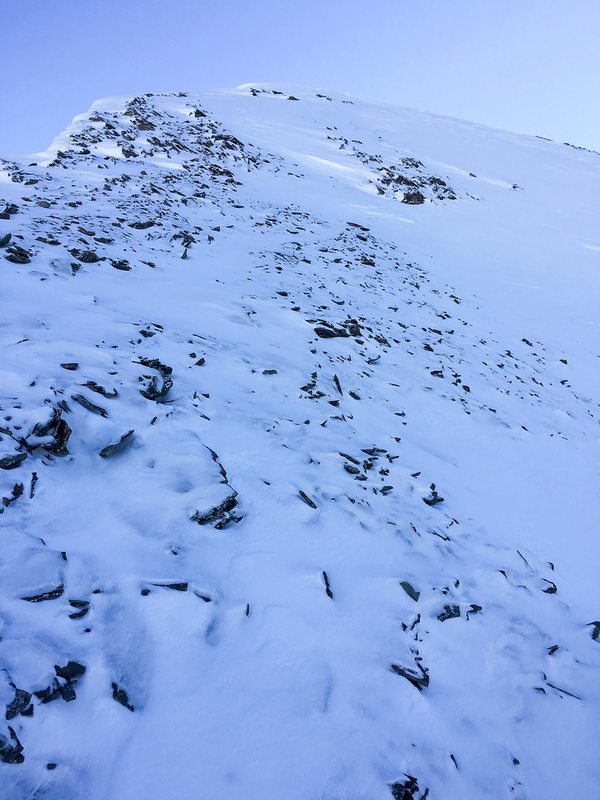 This is looking down the recommended Nugara avalanche chute ascent / descent route. I don't think this is a great route for most 'shoers. Time to head back down. Again - note the steep cliffs on climber's left of the ridge and the cornices. This is a good view of the trickiest section from near the second high point on the ridge. KC turned back here. A better view of the roll that Matt traversed on the upper left. 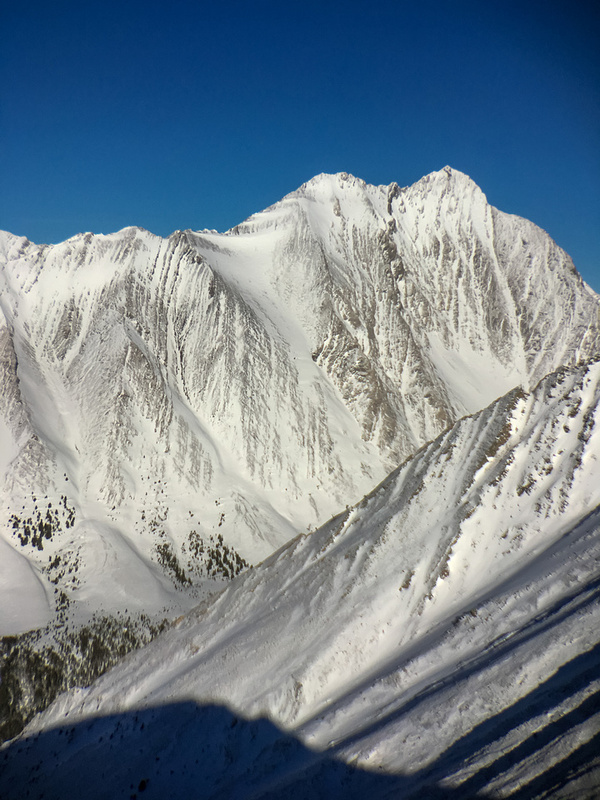 This is the top of the huge avy gully that Nugara correctly advises to avoid. Enjoying the sugar-snow on descent! 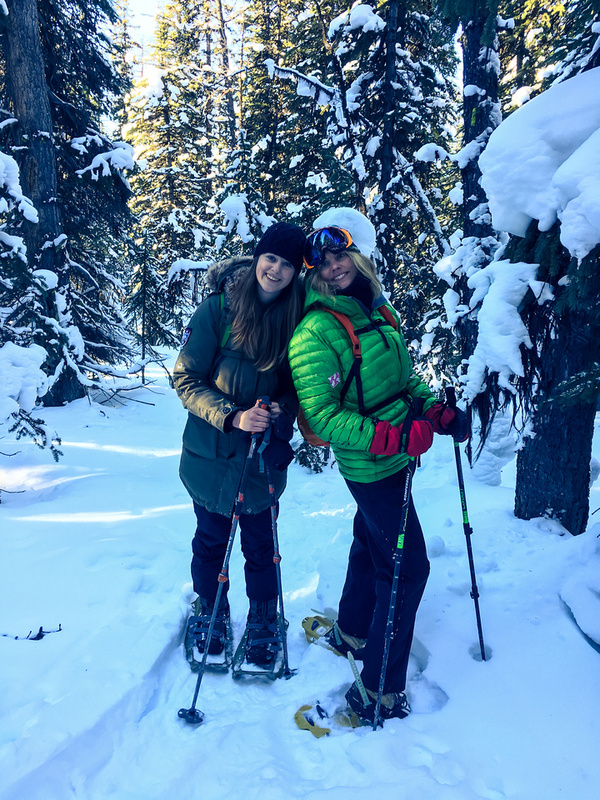 'Shoeing is a great family sport that doesn't require a ton of expertise or special gear.